Sabic and Art Centre College of Design have announced the winners of a three-month long competition focused on designing an innovative vehicle for Generation Alpha, anyone born after 2010. 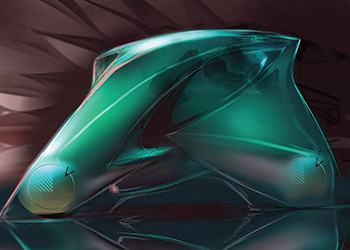 The Sabic-sponsored project, known as Design for Alpha, challenged Transportation Design students, to come up with bold, forward-thinking ideas on the types of vehicles that best meet the needs of this new generation, while offering a possible glimpse of where the automotive design industry may be headed by 2030 and beyond. Among the most jaw-dropping outcomes were the Hotspot Urban Base, a shape-shifting polyhedron 3D created vehicle with a giant, flexing ‘live hinge’ door; the ultra-aerodynamic efficient Air Runner designed for fully autonomous high-speed, long-range commuting; and the Transit Integrated Motive or TIM, a luxury transport system of customised pods with a shared platform for private owners or public use. Students drew inspiration from Sabic’s broad range of thermoplastic materials and solutions for the automotive industry, as well as the company’s insights and understanding of developments and trends in automotive design and production. The jury, which included 14 professionals from seven major OEM (original equipment manufacturer) design studios (Ford, General Motors, Mazda, Nissan, Subaru, Tesla Motors and Volkswagen), chose John McCarthy as the overall winner. Eric Sun and Axel Kurkjian finished second and third, respectively. All three students presented highly imaginative concepts and demonstrated innovative uses of plastics. Sabic awarded McCarthy, Sun and Kurkjian with scholarships valued at $5,000, $3,000 and $1,000. "We were delighted with the high calibre of the designs submitted and inspired by the students’ creativity," says Scott Fallon, general manager, automotive, Sabic’s Innovative Plastics business. "In Design for Alpha, their imaginations went into overdrive as they embraced the design freedom of thermoplastics and opened their minds to new shapes, functions and all kinds of possibilities. "We hope this experience has helped these young designers – future leaders within our customers’ design studios – understand that it can be very powerful when they’re thinking about material and process from the early stages of any creative project." 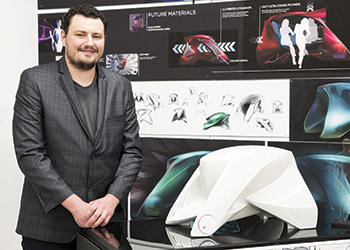 "Integrating material and process with design was an invaluable learning experience for our students," agrees David O’Connell, Art Centre instructor and former chief designer for Mitsubishi Motors of North America. "A designer needs to think about how any idea or concept will actually come to life, so it’s important to explore what types of materials and processes are needed for new product development. Keeping these considerations front of mind early on during the evolution of a vehicle is crucial to success." "The best professional designers embrace opportunities to connect with companies like Sabic who are pushing innovation through advanced technologies," says Stewart Reed, chair of Art Centre’s Transportation Design department. "I’m thrilled that our collaboration with Sabic mirrored this vital interaction and produced important knowledge that was applied to the creative process." "Our students were able to draw inspiration from a company deeply steeped in advanced materials and chemistry as well as experienced in working with major design studios and engineering groups," he continues. "The students went through the same cycle, the same steps and the same research as they would in a real-world design studio and that’s exactly the quality educational experience we strive to deliver at Art Centre." The project resulted in a diverse selection of approaches. No two concepts were alike with the students interpreting the needs and desires of Generation Alpha in different ways. Though autonomous driving was a common theme, the concepts differed considerably – from vehicles designed for high-speed commuting and off-road adventuring to those designed for urban mobility and public transport. John McCarthy’s model, the Hotspot Urban Base (HUB), is built upon the idea that Gen Aers will be more immersed in technology and have higher expectations for connectivity than any other generation. As such, this autonomous vehicle merges the digital and physical lives of its three passengers into one simple environment and allows for engaging digital experiences. The flexible design allows for its polyhedron 3D structure to morph into an almost infinite number of shapes and different levels of stiffness, similar to muscle fibres pulling and contracting as a skeletal structure. Thermoplastic materials allow freeform 3D-printed lithium ion batteries to be mounted into the vehicle’s fenders, allowing them to become cooling surfaces. Ultra-lightweight polymers create the ability to have a giant, flexing ‘live hinge’ door, providing very easy access to the front and rear seating areas. Ultra-soft, flexible shape memory polymers create personally customised interior spaces for the three passengers. McCarthy’s win didn’t come easily. Four weeks into the project, he broke his sketching hand while replacing the oil pan gasket on his 1972 BMW 2002. His hand was set in a cast for the next five weeks. Though he could not sketch, he used that time to develop a well thought-out and well researched concept, which clearly paid off in the eyes of the jury. Eric Sun’s Air Runner concept, with its dual-mode design and fully autonomous driving option, is intended for high-speed, long-range commuting. The layout and surging structural form enables excellent aerodynamics. Sun incorporated many uses of plastics, including shape memory polymers to allow the body to conform to aerodynamic efficiencies. Electrochromic plastics allow the cabin to blend into the upper body for a private and seamless aesthetic, and the upper body can switch back again from a solid colour for privacy to a clear transparent for enhanced visibility. Thermoplastic composites make possible a stronger, light body and also allow for the use of one larger door for entering and exiting the vehicle. Axel Kurkjian’s luxury transport system, the Transit Integrated Motive (TIM), is a fully autonomous vehicle and shared transportation platform that can be owned privately or made accessible to the public. Individual pods are available for single passengers as are larger pods for two to four passengers. Advanced reinforced plastics are used for the vehicle frame and other structures, while polycarbonate materials are used to help enable full touch screen interaction capability and external displays. The pod interiors are customised through 3D printing. Sabic also presented two $500 Art Centre scholarships. Iljung Jeong received the Design Leadership award for his strong work ethic, proactive nature and eagerness to apply what he had learned. Jaesung Kim was recognised with the Vehicle Emblem award for creating the winning Design for Alpha logo, which was a competition among all students. Jurors for the competition were Freeman Thomas, Jeremy Leng, Jordan Meadows and Lon Zaback from Ford; Frank Saucedo and Heidi Bliss from General Motors; Jacques Flynn from Mazda; John Sahs from Nissan; Masahikio Kobayashi and Matthew Wherry from Subaru; Lauren Szczesny from Tesla; Jae Min from Volkswagen; Ruben Perfetti from Gulfstream Aerospace; Scott Fallon and Geert Schellekens from Sabic and Stewart Reed from Art Centre.